Life Tastes Good » 2009 » September - A diary of food and wine from the perspective of a passionate cook who is inspired by the colors and flavors of the changing seasons. September has been quite the whirlwind month… The beginning of the fall season has brought with it “back to school” events, long commutes to work, and a cornucopia of delicious produce at the markets! September started off with a bang – Labor Day Weekend. The weather was perfect, and the weekend was jam-packed with activities. I started the weekend with a girls evening at my friend, Roshni’s home. Tere brought Ami along who was visiting from Michigan, and we had a spectacular evening – eating, drinking, chatting… doing what girls do best! Roshni wowed us with her elegant presentation of herb marinated chicken, roasted mushrooms, and sweet pea risotto. Something she just “threw together.” That’s what you get when you are in the kitchen of an FCI grad! Saturday brough t perfect weather… so Manish and I decided to venture to the Green Market at Union Square. Joining us were our daughters, our nephews, and Jigna and Piyush… it was a family affair! We picnicked afterwards – enjoying fresh breads, cheeses, jams, berries, spicy radishes with fresh churned butter, and cold cuts. 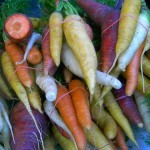 My most unusual purchase that day was the rainbow assortment of carrots… white, yellow, orange, and purple. Each hue lent itself a unique flavor. 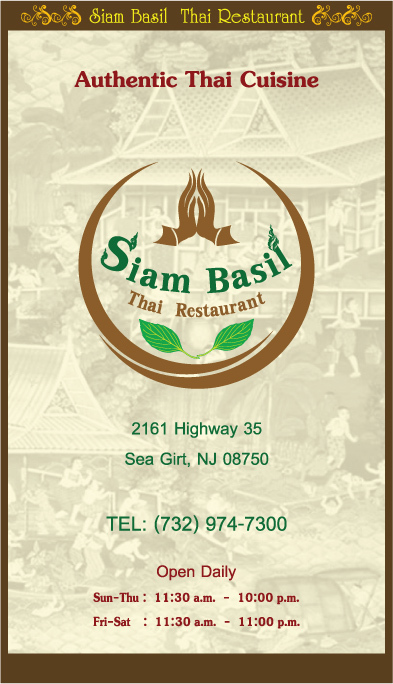 Sunday night marked a most anticipated evening of fun, laughter, good food, and great libations! Sejal and Reena organized this evening of cocktails and paired foods for some of our closest friends. Sejal and Rick hosted. The weather was perfect. The cocktails were delicious. The food was divine. And that’s about all I remember… The photos that I DO have from the evening are ones that I should not share on this site (lol) But at least let me tell you about the menu… Heirloom Tomato Mojitos; Pumpkin Martinis; Bellinis; Blueberry Thyme Cocktail; Lady Sage; Kachumber Coolers – These were the cocktails that were served. The food was paired along side – we had home-made samosas, wild mushroom popovers, beef and vegetable empanadas, curried paneer in choux puffs, butternut squash and apple soup, quesadillas with salsa verde. All in all – an incredible evening with wonderful friends. It was the perfect weekend, spent with family and good friends, celebrating the end of a lovely summer. This was the theme at a dinner party hosted by yours truly this past weekend. We had our very charming friends – Len, Aileen, Tom, and Flora – over for what we intended to be a fun grilling evening. But due to the “weather witch,” (aka RAIN RAIN RAIN) we dined indoors. “A Savory Summer Supper” is what we focused our meal planning around. We started off the evening with the incredible 2005 Gilbert Picq Chablis. A magnum at that! It showcased the perfect balance of fruit, minerality, acidity, and “stony-ness” that you look for in a Chablis. If you are not familiar with the terroir (or the land and geographical surroundings) of where the Chablis region’s grapes are grown, let me enlighten you! The soils in that region are very special. The basin of limestone marl that runs all the way down through the Champagne region, into the Loire, Chablis, and other parts of B urgundy is known as the Kimmerdgian Trail. All of the soil from these regions contain that limestone clay which is heavy with nutrients of the sea shells and fossils from many, many years ago. The grapes pick up those slate-like tones and the resulting wine is perfectly balanced with a stony minerality and vibrant fruit. Lovely! 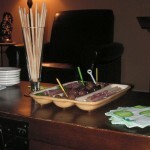 With the Picq Chablis, we enjoyed an array of hors d’oeuvres. Asparagus and thin bread sticks wrapped in “truffled” prosciutto di parma; Summer garden bruschetta; Assorted Olives; and something that I never served but intended to… Summer Fruit Gazpacho. More on that later! We took our places at the table and started our meal with quite a bang. The 2008 Domaine Tselepos White Mantinia paired magnificently with Len’s Melon Salad. 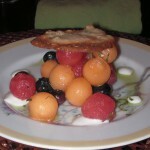 Perfect spheres of watermelon and cantaloupe accompanied with blueberries, basil, Greek yogurt, and sesame oil. Topped off with a camembert tuile. It was texturally SO appealing – and extremely flavorful. A perfect starter course to our Summer Supper – thank you Len! The Moschofilero (The lovely asromatic, crisp, clean wine that we speak of above) carried itself through the next course. Heirloom tomatoes were the focus here. 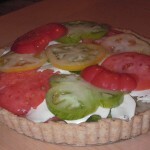 A fresh tomato tart – with a parmesan and black pepper crust.A great way to use up your garden tomatoes – here is the recipe… It was a true representation of what late summer represents. So clean, pure, and fresh! 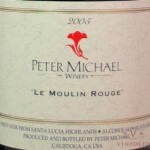 We moved onto the 2006 Peter Michael Le Moulin Rouge Pinot Noir. Exquisite – definitely young but contains enough structure and finesse to pair with the next course. I must say that I was a tad intimidated to show this wine. But Manish and I enjoyed it when we first sampled it in CA last year. It was showing 100 times better than our last tasting – and it was perfect with the Ravioli Oeuf with Truffles. With the yolks still on the “softer side,” these raviolis, stuffed with a savory ricotta filling and an egg yolk, were so decadent. The filling had a dash of lemon zest which really brought out the nuances of all of the other components. The truffled butter sauce revealed an earthy note to the entire course. It was so savory, and now one of my favorite stuffed pasta dishes of all time. Our guests brought outstanding wines to pair with the next course. 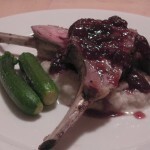 Rack of lamb with Fig Gastrique over a sunchoke puree with baby zucchini. The 1988 Chateau Beychevelle Saint Julien was showing very well. After letting it breathe for a an hour or two, this wine was showing hints of cedar, earth, dark cherry, and tobacco. I wrote down “caramel” but by that point, I had consumed enough glasses to assume that I mis”wrote.” So unless that seems normal to you, just disregard! 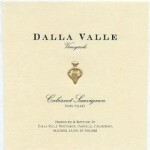 On the opposite spectrum was the 2001 Dalla Valle Cabernet. This had a more pronounced nose of licorice, dark fruit/berry, and coffee. The fruit was there but in an elegant style. Both wines paired well with the meal – the Bordeaux reflecting the earthy and game-y qualities of the dish while the Napa Cab supported the flavors of the gastrique. Flora’s dessert was phenomenal. A chocolate tart with a delicate shortbread/almond crust. 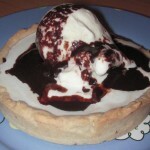 Topped off with a scoop of vanilla ice cream and home made chocolate sauce. Decadent. While everyone was announcing how they could only possibly have a bite, I went on to practically lick my plate clean (figure of speech people!) The 1992 Taylor Fladgate Vintage Port and the 2004 Zinskey Late accompanied this course. The perfect ending to a very satisfying meal! More than the meal itself, I was thrilled to be able to share the table with these food and wine loving friends of ours. Thank you for the lovely evening, and here’s to the next one! Cheers! You are currently browsing the Life Tastes Good blog archives for September, 2009.